Villa is idyllically situated amid vineyards and olive groves. A large swimming pool (5 x 12 m) belongs to the villa. 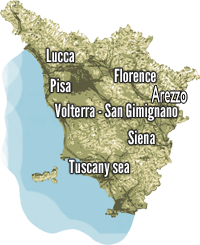 Villa offers a magnificent view of the plain of Lucca and you can see as far as the Monte Pisano hills. On the ground floor, there is a living room with fireplace and TV/DVD, a dining room and the spacious, open kitchen, equipped with all modern facilities such as oven, microwave, fridge, freezer and dishwasher. A guest bathroom and laundry facilities are also located on the ground floor. On the first floor, there are two large bedrooms with double beds, each one with a private bathroom, and a single bedroom without bathroom. On the second floor there are two more double bedrooms with private bathrooms and a seatting room with sofas and TV to relax. Villa accommodates comfortably 9 guests. Forniture: Microwave, dish-washing fridge, TV, Stereo, DVD, Solarium, table and chairs to eat outdoor, Barbecue, parking swimming pooò. Prices accommodation included towels and linen (first forniture), final clenaing, swimming pool (may-september), garden, parking.